Who was the first actor to play James Bond? If you answered Sean Connery, you would be wrong. 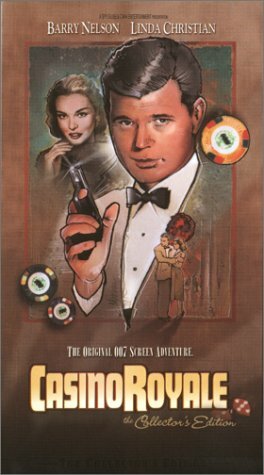 In 1954, Barry Nelson played Bond in 007's screen debut: a 1954 live t.v version of the first James Bond novel "Casino Royale". Spy Guise Video now makes this amazing and historic program available - complete with the restored ending missing from previous video versions. This deluxe collector's edition also features many extras: an exclusive overview of the life of Ian Fleming and the "Casino Royale" legacy hosted by Lee Pfeiffer, co-author of the best-selling book "The Essential Bond: An Authorized Celebration of 007". Additionally, this version contains rare promotional advertisements, photographs, and information about James Bond clubs, magazines and officially licensed collectibles. No James Bond fan will want to be without this definitive collector's edition of 007's screen debut. Recorded in the SP mode for superior quality. A nice TV play -- but an American James Bond?? Barry Nelson was the first Bond on Screen! The 1954 version and the 1967 spoof version. The 1954 Climax version has been published in two video versions-one in the US and another shortened version in Europe.The shortened version was released on DVD as extra material on the 1967 Casino Royale DVD release in the US. Collectors and fans know that the last minute of the 1954 Casino Royale version hasn't been released in Europe...Bond killing Le Chiffre. Peter Lorre, Linda Christian and Barry Nelson completes the set adapted from Flemings 1952 novel Casino Royale. Barry Nelson last motion picture was Island of Claws from 1980. His most rememable performance are Airport and the Shining. He was born in 1920 and is of Scandinavian origin. The 1954 version is much better than the 1967 spoof version, no doubt. But still it would be fantastic if the Bond producers would make an updated adaptaion of this first Bond novel. The first James Bond movie ever! Dr. No is actually not the first 007 movie, 8 years before that Climax Theatre for CBS Television produced a TV movie called Casino Royale. 007 was known as "Card Sense Jimmy Bond" and the entire movie was based in a hotel casino. The movie was rereleased in the early 90's, but did not contain the ending in which Bond battles Le Chiffre. This tape is the only one that does contain the entire movie from beginning to end. The movie begins with an introduction by Lee Pfeiffer who tells about this movie and the 1967 spoof version. The movie begins with Bond being shot at while entering the casino, but the culprit escapes. Bond meets up with Clarence Leiter, in which they discuss Baccarat and the evil Le Chiffre. Bond is told that Le Chiffre has gambled and lost 80 million francs of Soviet money and is planning to win it back to try to clean the mess with his employers. Bond's job is to make sure that he loses. bond also meets Valerie Mathis who appears to be working for Le Chiffre. As the movie continues, Bond and Le Chiffre play Baccarat with Le Chiffre cleaning out Bond. Bond then mysteriously recieves 35 million francs and wins 87 million francs all from Le Chiffre. Valerie is kidnaped, but she returns to Bond in his hotel room where they are trapped by Le Chiffre and his thugs. bond is tortured to tell where he has hidden the check for the money. Bond escapes and shoots Le Chiffre, who still survives. Bond, Valerie and Le Chiffre all meet in the sitting room of Bond's room where Valerie confess that she is a French agent, who still loved Bond and gave him the 35 million francs. (At this point the tape gets fuzzy and harder to see, as obviously this is the part that has finally been restored.) Le Chiffre holds Valerie with a knife at her chest when Bond shoots and kills him. the actual film is a recording of a life televised play. Consequently not the Bond spectacular you are acustomed to. It also airs the time when it was recorded. Slow-ish. Still, it completes my Bond collection and the picture and sound quality was good to very good, considering the age. So, yes I am pretty happy with this addition to the collection and, no I probably won't watch it a second time. But I will be showing it off. Many think that Sean Connery was the first actor to impersonate the role of the sophisticated British agent; when in fact he wasn't. Sean was the first actor to play bond in a "theatrical" movie. But in 1954, 8 years before Dr. No hit the screens, 007 was introduced for the first time on Television broadcast. The movie was called Casino Royale, based on the first novel by Ian Fleming. The movie was adapted from this novel for a CBS broadcast, with the hopes of adapting more of Ian Fleming's novels on TV...but the broadcast was pretty much bashed by critics and ignored by viewers. The movie was broadcasted only once and lost. It was later found and re-broadcasted in the 1990's for TBS, part of a James Bond movie marathon. Thought the problem with that version that was re-aired was that it was missing the final confrontation between Bond And The villainous LE Chifre. This broadcast was available before the broadcast on video in the late 80's. But like the broadcast it was missing the last 5 min. But the wait is long over because Spy Guise has released a special collector's edition that re-stores the missing footage, and re-mastered it to the best possible quality. The only bad quality I would say is the final missing footage, this is due to long years of storage and moist. But other than that this is the complete version of the first broadcast. Another great thing about this VHS is that it has a wonderful intro by Lee Phiffer, who gives an overview of bond's persona and history. And stay tuned after the credits for more info on bond. The action is a bit dated and cheesy, due to limited budget and time restraints. But the flick is interesting to see the first portrayal of Ian Flemings' literary spy. Oh and a word of advice, do not purchase the DVD version. there are various editions, some ranging up to 40 bucks, others for a mere dollar; it doest matter how much they cost, neither represents the complete version, and none of those have the special features this one has. > AN EXCLUSIVE INTRO BY LEE PHIFFER, EXPALINING THE STORY OF THE NOVEL AND THE 1967 SPOOF VERSION.